Photos of Asian people, their hands holding signs with their identification numbers, and official-looking documents with names and dates are the first things that really get the attention of Chia and Hillary Lor. The display of photo IDs and paperwork that enabled Hmong refugees from Laos, Cambodia and Thailand to resettle in the United States beginning nearly 40 years ago is part of a large exhibit at the Minnesota History Center in St. Paul. 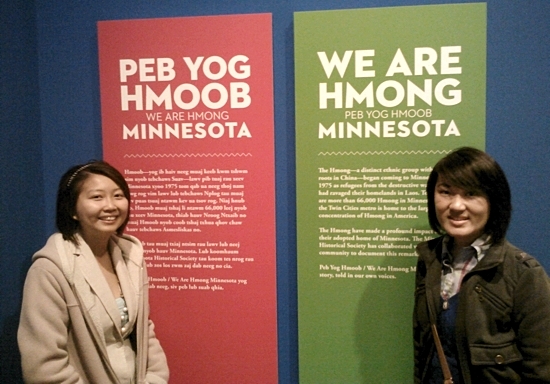 In order to see the exhibit through the eyes of the Hmong, I asked the Lor sisters — members of the Hmong Catholic community at St. Vincent de Paul in St. Paul — to do a walk-through with me. Simply tell me what you are thinking, I asked, as you view the displays and watch the video and multimedia screens. Chia, 22, is a St. Catherine University graduate who works as a community organizer for the District 1 Community Council in St. Paul. Her sister Hillary, 20, is a sophomore at St. Catherine majoring in public health with a minor in communications studies. “That’s my refugee camp,” Chia says, pointing to a photograph on one of the displays. She lived at Chiang Kham in Thailand as an infant, and came to the United States in 1994. Hillary is the youngest of the Lor children, the only one born in this country, hence her American name, which was inspired by Hillary Rodham Clinton. “I was raised and baptized at St. Vincent.” she chimes in. 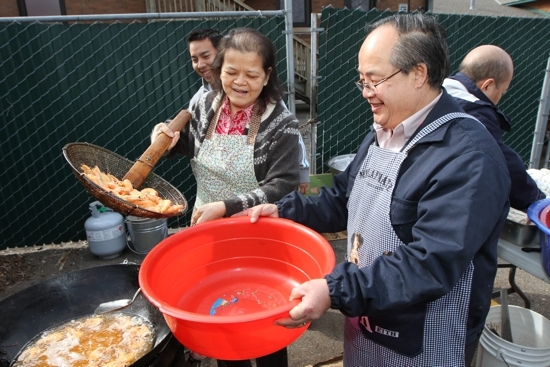 “I’m as old as St. Vincent.” On Easter, St. Vincent de Paul celebrated the 20th anniversary of becoming the home of the Hmong Catholic community. Photos of Hmong people in the refugee camps remind the sisters of their late grandfather, Nhia Ying Lor. Their father, Cha Lor, was a youth leader in the camp, and Chia is following in his footsteps, volunteering as a youth leader at St. Patrick in St. Paul, where the Hmong community is expanding. 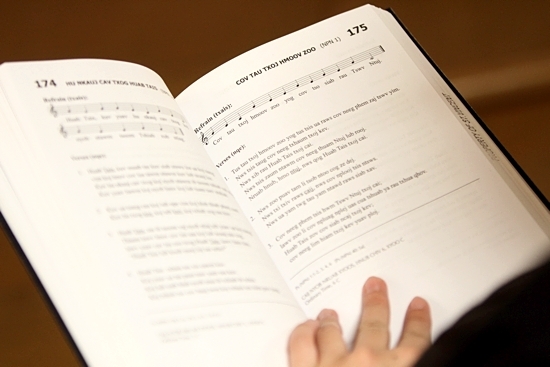 The women are disappointed that a display about the Hmong language doesn’t include the Catholic connection they consider vital. Father Bertrais is also the reason the Lor family is Catholic. As the sisters view embroidered textiles, musical instruments and rudimentary farm implements that were part of daily life in southeast Asia, they share how their grandfather, the youngest son of a family with 12 children, was sent to live with the priest, an Oblate of Mary Immaculate who had come to the mountains of Laos in 1950. Hmong, who had left China due to oppression, willingly fought against the communists in the “Secret War” in southeast Asia. Men of the Lor family fought alongside U.S. troops. The video of the war, bodies of men, women and children lined up along a road, makes Chia reflect on the horrors. When the United States removed its forces in 1975, the Hmong had to flee, too. A moving video captures the emotional moment when some Hmong board buses to leave Laos, while others tearfully remain behind. When Cha Lor and Fanci Vang, the Lor sisters’ parents, were granted refugee status in the United States, they came to St. Paul, where family members were already living. They lived in public housing in the McDonough Homes for five years before moving to a house on the east side of St. Paul. Their Catholic faith starts in the home with their father, they say, and having priests and sisters in their lives, such as Father Joseph Johnson, former pastor of St. Vincent de Paul and current pastor of Holy Family in St. Louis Park; the Missionaries of Charity; and the Sisters of St. Peter Claver. Photos of Hmong gardens and their produce at farmers’ markets remind the two of their friends. “Their families farm, and our friends have to work weekends at the farmers’ market,” Hillary said. Their own father is a machine operator at a local firm, and their mother is a technician who makes hearing aids. The Lor sisters are excited to see that Yang Dao is recognized in the exhibit. 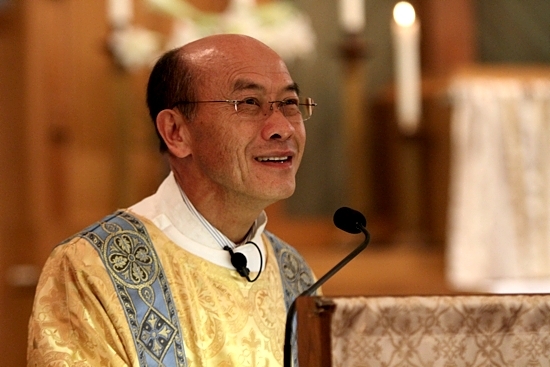 He is a St. Vincent de Paul parishioner and was the first Hmong in the world to earn a doctorate. Dao is remembered for his efforts to contact ambassadors around the world to persuade their countries to accept some of the 40,000 Hmong who were trying to escape the communists. The exhibit includes screens with video of Hmong entertainers, and they stop the sisters for a few moments. “Hmong bands and artists are known to Hmong people throughout the world,” Hillary notes. She watches and listens for a while to a young Hmong female singer in modern western dress who belts out a ballad in Hmong that has a familiar melody. Election campaign posters of Hmong leaders who have run for public office color one wall, and the Lor sisters point with pride to those who now represent them in various local civic bodies. Nearing the end of the exhibit, amid glass-covered displays of colorful native garments, farm tools, weapons of war and military uniforms, something stirs deep inside Chia Lor. She was just 2 years old when her family left Thailand and resettled in Minnesota, so she doesn’t remember that era of Hmong life. For the opening of the exhibit a few months back, Chia was part of a duo that performed the poem “1.5.” The title reflects what she and others often feel, being part of American society but also part of Hmong culture. Both sisters say they’ve been the targets of racists who tell them to go back to their own country, and yet they’ve also been accused by Hmong of being “white-washed” — too American. “When I hear those remarks, they energize me and motivate me to do well in school — and to be a good person,” Hillary says. 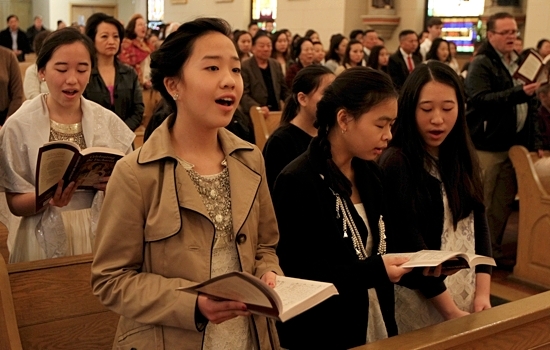 “When you think about the Hmong-Catholic experience, we’re like the Israelites,” Chia says. “We’re dropped out of oppression in China and given the opportunity in Laos to know God and to prosper in our faith.